It is a nice sink. I do like the hammered appearance it goes really nice with faucet of the same finish. I would recommend to anyone that is bored of the same old white sink everyone has. 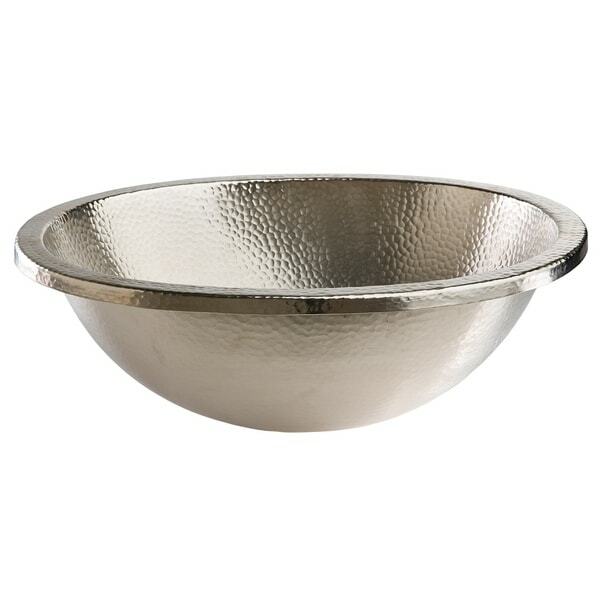 The Edison is a hand-hammered and affordable nickel bath sink. This individually handcrafted bathroom sink is made with a luxurious hammered nickel finish.The bold and innovative design offers more than just a sink; it is a work of art for your home. Featuring a maintenance-free finish and straightforward installation, a hammered nickel bathroom sink from Sinkology is intended for everyday living and offers a lifetime warranty. Outer Dimensions: 18.5" x 15.5" x 6.5"
Inner Dimensions: 16.25" x 13.5" x 6.25"
Absolutely stunning in my new guest bath! Must wipe out after each use to avoid water spots. The hammered finish adds such character my bath. 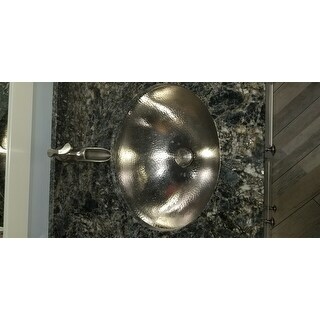 I ordered this hammered nickel sink for one of the two powder rooms in our new house. It really makes a statement and I couldn’t be happier with it. I highly recommend it....you will love it!!!! This sink is beautiful! The picture online cannot show how pretty it is! Extremely high quality and heavy weight! I would highly recommend this sink to all that are interested!! It is a beautiful sink. I can not wait to install it. I haven't had it installed yet...but gorgeous sink and seems well made. Everyone that sees this sink loves it. The only thing is that it will show water marks. This was a excellent buy and is a centerpiece to the bathroom. Ordered a second one for another bathroom. 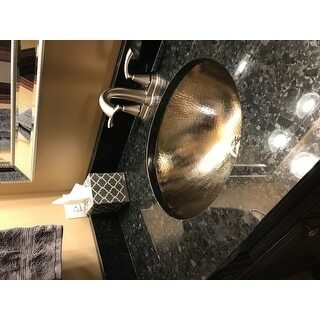 I bought three of there sinks and installed in the master bathroom and a pool bathroom under white galaxy granite. They look beautiful and expensive! Paid less on Overstock than another site. You need to keep wiped down and polish once a month to maintain the lustre, but it is worth it. This sink under-mounted beautifully. It makes a statement. "I am looking for an undercount KItCHEN SINK 33" in hammered peuter-nickel -silver. Do you make one?? Pease advise asap. In gratitude, Monica"
"I love this sink but I don't see an overflow- is it hidden in the picture? If there is no overflow has anyone had problems with it draining slowly?" This sink does not have an overflow. This is a very popular sink, but we have not had any customer complaints on it concerning the draining. "what is the best way to clean this sink? Is it stainless steel?" It's best to use either a silver polish or automotive chrome polish to take any stains off of the sink that simple soapy water and a cloth can't take off. The nickel is tough. "What is the Drain size? Is the drain assembly included?" I don't remember the drain size but I do remember having to go to a specialty store to buy the drain and not sure who gave me the wrong info but it doesn't work right. I think I spent about the price of the sink on two drain assemblys - so beware! This sink will take any 1.5" inch bath drain. The G15-BRN or P15-N will fit this sink perfectly. "Does the finish have a brushed nickel or shiny chrome look?" The sink has a shiny chrome look. "Does this include 2 sinks for the $***?" This listing is for one sink. "As I would undermount, the INSIDE dimensions are also important. So please advise the dimensions of the basin itself. Thanks in advance. Lu Rose 4-7-16"
The sink dimensions (cut out dimensions) are approximately 15 inches wide x 18 inches long x 8 inches deep.